Beautifully engraved certificate from the Garfield Monument Fund. This historic document was printed by W.J. 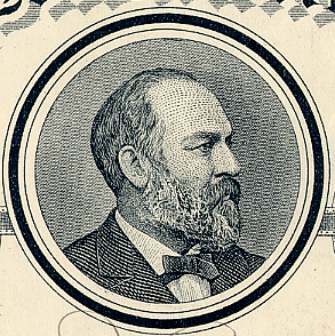 Morgan & Company and has an ornate border around it with a vignette of President James A. Garfield picture. This item contains the printed signatures of the Organization's officers and the late president, James A. Garfield. The Garfield Monument Fund was set up for a monument at the Lake View Cemetery.